PRESS RELEASE: In an ongoing effort to offer high-end features, unsurpassed quality and maximum value to both retailers and consumers, Drum Workshop has announced the addition of the Mainstage Series to its value-priced line up. Designed to offer entry-level players, educators and parents a complete turnkey package, Pacific's new Mainstage Series includes a durable wrapped finish that's available in two distinct colours, Bronze Metallic and Black Metallic. The 5-piece kits come in F.A.S.T. sizes, which include 8x10", 9x12", 14x16" toms, 16x22" kick and matching 5x14 snare and retails for $1,166.99 with a Pacific hardware pack that contains a CB700 cymbal boom stand, CS700 straight cymbal stand, SS700 snare stand, HH700 hi-hat stand and drum throne. The complete set-up also includes Sabian SBR crash, ride and hi-hat cymbals. Vice President of Sales, Jim DeStefano, comments, "We had amazing success with our entry level Z5 Series last year, but we felt that we could still offer drummers an even better value if we paired up a similar shell pack with stands and cymbals. "We're drummers and we're also parents, so we know that it can be challenging to find time to research a purchase like this. 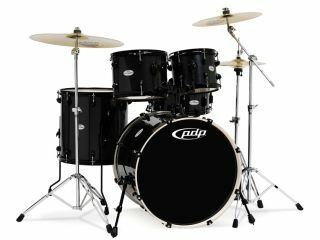 Having everything in one convenient package is a no-brainer for first time drum buyers."